It’s often foggy in the early morning, as you can see in the pictures. It’s not usually very cold though – especially when you are hiking up the hill with a bilum full of produce! You see, this morning was a market morning. 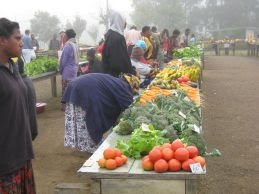 Every Monday, Wednesday and Friday, local villagers bring their produce to Ukarumpa to sell. Market only runs from 6:30am to 8:00am, so you have to be an early bird. The store only sells onions, garlic, and “exotic” things like apples. So if you want fruits and veggies, you have to go to market. I’m an early bird, so I don’t mind at all. Ukarumpa is built on a hill, and we live at the very tip top. The market is down at the very bottom, which means we have an easy 7- or 8-minute walk down, and that by the time you reach the top again with your purchases, you’re a bit out of breath! When we were living on the coast during orientation, we got tired of the monotony of available veggies. There are only so many things you can grow in a hot, tropical place. But up here in the highlands, the weather is like Oregon springtime year-round. This means that we get a big variety of the same types of vegetables that we are used to at home. One of the nice things that you can get at the market is fresh beans. By this I mean black beans, kidney beans, and various other colorful speckled beans I don’t have a name for. They cook the same as buying dried beans, you just can skip soaking them! We can also get strawberries, watermelon, pineapples, bell peppers, and corn. This morning I bought broccoli, tomatoes, carrots, a bunch of bananas and a half dozen passion fruit for about $3.28. Fresh produce a few times a week sounds really nice, the walk back sounds pretty brutal. Watched the video you guys sent home to your family, it was really good, and great to see you guys in action. Wow, what a lot of work for a couple hour market. Hope they sell lots while they are there. As a fellow Saturday Market Vendor they seem like they have quality produce. Nice to see they have some rules also, like not stepping over food on the ground, sounds like a good one! A couple of questions, on the top picture at the market, what are the things to the left of center that look like they are sticking in the ground? flowers? if so, what type? Also, where do the tables come from? Do the vendors have to rent a space? How are they "chosen" to come? Do they limit how many vendors can come? and how many tables they can have? I have enjoyed your blog and you have interesting entries. Your picture at the top is cute, too. Susan, did you cut your hair? It looks good.